Each Infant Mental Health Endorsement® category has specific work, education, in-service training and reflective supervision/consultation requirements, specific to pregnant women, young children, aged 0-36 months, and their families. In addition, Endorsement® applicants will demonstrate achievement of competencies, as defined in the desired category. This chart represents only a summary of the IMH Endorsement® categories. Detailed information specific to each category can be downloaded from the links below. Please note: Copyright law does allow individuals to print out or make ONE copy of copyrighted material for personal, non-commercial purposes only. None of the copyrighted Endorsement® documents included here may be reproduced, displayed, distributed, or otherwise used in any format, including electronically, without the express written consent of MI-AIMH. Legal action will be takenagainst those who violate the copyright. 1 Infant Family Associate applicants need to meet the Education OR the Work requirement they do not need to meet both. 2 For Infant Family Associate applicants, volunteer experience may meet the work criterion if it was a) supervised experience with women during pregnancy or with infants, toddlers, & families AND b) included specialized training. Examples include CASA, Doula, Child Life Specialist. 3 Only Infant Mental Health Mentor - Clinical applicants need to fulfill the requirement of being a provider of RS/C for 3+ years. Download Four Pathways to Infant Mental Health Endorsement®. This brief webinar answers the question "What is Infant Family Associate Endorsement®?" and walks through the steps to consider if this category is right for you. This brief webinar answers the question "What is Infant Family Specialist Endorsement®?" and walks through the steps to consider if this category is right for you. This brief webinar answers the question "What is Infant Mental Health Specialist Endorsement®?" and walks through the steps to consider if this category is right for you. This brief webinar answers the question "What is Infant Mental Health Mentor Endorsement®?" and walks through the steps to consider if this category is right for you. Reference ratings for Endorsement® are critically important. They are our primary source for documenting an applicant’s skills in the domains of Reflection, Working with Others and Thinking. Funk, S., Weatherston, D., Warren, M., Schuren, N., McCormick, A., Paradis, N., & Van Horn, J. (2017) Endorsement®: A national tool for workforce development in infant mental health. Zero to Three Journal, 37 (3), 50 - 57. Fyall Cardenas, J. & Tanco, I. (2016). Elevating the field of early childhood education through endorsement®: An International standard of excellence in infant mental health. Early Years, 37 (2), 63 - 64. Priddis, L.E., Matacz, R., & Weatherston, D. (2015). Building a workforce competency-based training program in infant/early childhood mental health. Infant Mental Health Journal, 36 (6), 623-631. Weatherston, D.J., & Paradis, N. (2011). 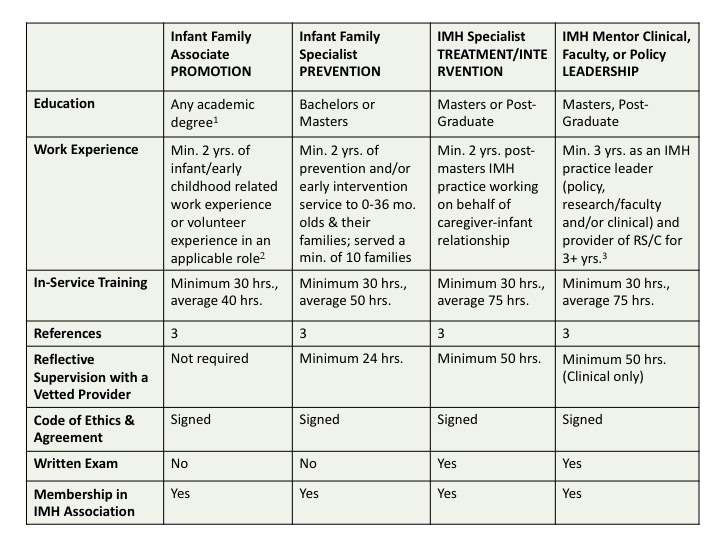 Defining Professional Competency in the Infant Mental Health Field. Journal of ZERO TO THREE, 32 (1), 37-43. Weatherston, D., Kaplan-Estrin, M., & Goldberg, S. (2009). Strengthening and recognizing knowledge, skills, and reflective practice: the Michigan Association for Infant Mental Health Competency Guidelines® and Endorsement® process. Infant Mental Health Journal, 30(6), 648-663. Weatherston, D.J., Dowler Moss, B., & Harris, D. (2006). Building Capacity in the Infant and Family Field Through Competency-Based Endorsement: Three States’ Experiences. Journal of ZERO TO THREE, 26(3), 4-13.